I feel like I learned a lot from MeMadeMay about what I actually wear and what I like to think that I wear. So I am determined to keep that in consideration when making my summer wardrobe. Here is my mood board. This is a very rough idea. I don’t want to copy these things, but make something in this ball park. White Scout Tee : Boring I know. It became very apparent during MMM that I had a big gap in my wardrobe when it came to a nice white blouse. Tie-Dye Blouse : I have had this blouse pinned on pinterest for awhile now. Ever since tie-dying my maxi dress I am itching to dye something else. I am hoping to recreate something really similar to this blouse for myself. I am thinking maybe gray instead though. Floral Blazer : I know – it’s summer, so why am I making another blazer? But I have worn my chambray blazer so much and I keep wishing that I had another one. I really want to make at least one more for those breezy summer nights in a lightweight cotton. I am really hoping for a floral, but would also love any really cool print. Peplum Top : Another thing that I have been wanting for awhile is a peplum top. 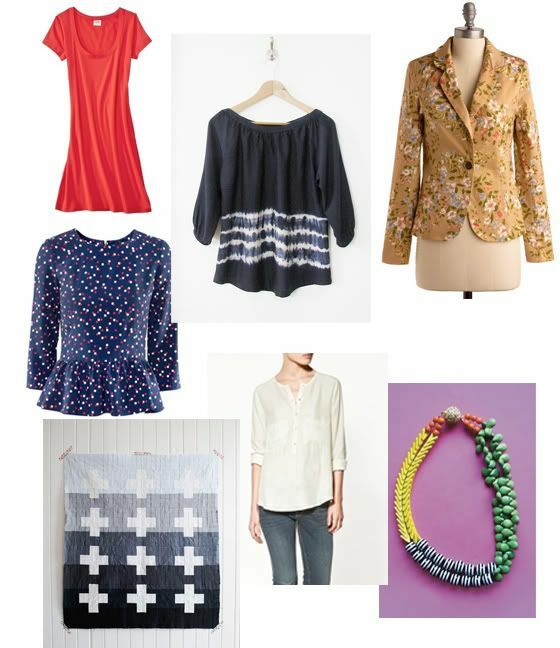 I love this trend and want to make at least one that is airy and lightweight for summer. Plus I love the way they look with both pencil skirts and skinny jeans. Cap Sleeve Knee Length Jersey Dress : I just want an easy dress that I can throw on with sandals and a belt and feel polished, but also really comfy. Statement Necklace : I know it’s not sewing, but it’s crafty and it’s for my wardrobe. Both my maxi and midi skirt are screaming for a statement necklace. I feel like I can make one myself and I have seen a few tutorials of late that I will be using as well. Large Modern Quilt : As most of you know we are moving to NYC in a couple of months. As a result our bedroom will most likely also be our living room. We have never done much with our bedroom because no one else sees it, but now that it will be seen I really want it to look intentional. I have never really quilted before or had much desire to quilt. Mostly because quilts don’t really fit my style. But recently I have seen some really cool and simple modern quilts that I think would be awesome. The one in the image above is from bonjour celine and is stunning. I am not sure what I want mine to look like, but I will definitly be inspired by the color palette and lines of this one. I’m seriously loving the floral blazer idea! I can’t wait to see what you make 🙂 I might have to make myself a floral blazer too! thanks ashley. i am hoping that by making it floral it will still be summery enough even though it is a blazer. can’t wait to see yours too. I am all to familiar with the NYC, bedroom is the living room is the dining room is the kitchen is the office issue (though I’ve finally escaped it!). Be sure to check out Small Cool on Apartment Therapy if you haven’t already – lots of inspiration to be had. We also found our Expedit Bookcase aka Room Divider from IKEA to be very helpful. Mika, so do you still live in Brooklyn then? That is where we are looking at to move mostly. If so we should get together sometime and you can show me all of the best fabric shops. Thanks for the recommendations! I love the look of the tie-dye shirt. I could do with a few of those. thanks, i am hoping that it turns out well. i just bought some silver gray dye to use so i am pretty excited. this looks like a fun list! and also practical – which in my book is key. you’ve reminded me that i’ve been meaning to make a simple quilt from scraps from our wedding bunting for almost an entire year now… might be time to start that!! that sounds like such an awesome quilt sallie. so personal. i hope you post it on your blog for us all to see. Love the peplum top and the quilt. i am not a quilter either but I have been thinking about making one…my home is not in quilt style but the picture above looks great…only issue is…space for making it! i didn’t even think about space to make it. i guess i need to start making it while i am still here and not in nyc. thanks for the reminder. Love all the plans but seriously especially the quilt! I have a feeling you’ll love quilting, it’s pretty relaxing and I think it’s a lot of fun to sleep under something you made every night! Also…summer blazer club, you and me, boo yah! relaxing sewing sounds awesome. i really enjoy sewing clothes but i think that it will be really nice to sew something that i am not worried about fitting. what you see is what you get. and you are right. there is something very personal about sleeping under something that you made. i like that.